The past week has seen a huge change in the weather across Ireland. The countryside is full of activity, both with plant and animal life and we at Rent An Irish Cottage are always excited by a change of season, a reason to celebrate. Delightful spring flowers are starting to dot our landscape and remind us to get out an enjoy the fresh air and stunning countryside! Even in urban landscapes daffodils and potted flowers herald a new season bringing joy with finer weather. 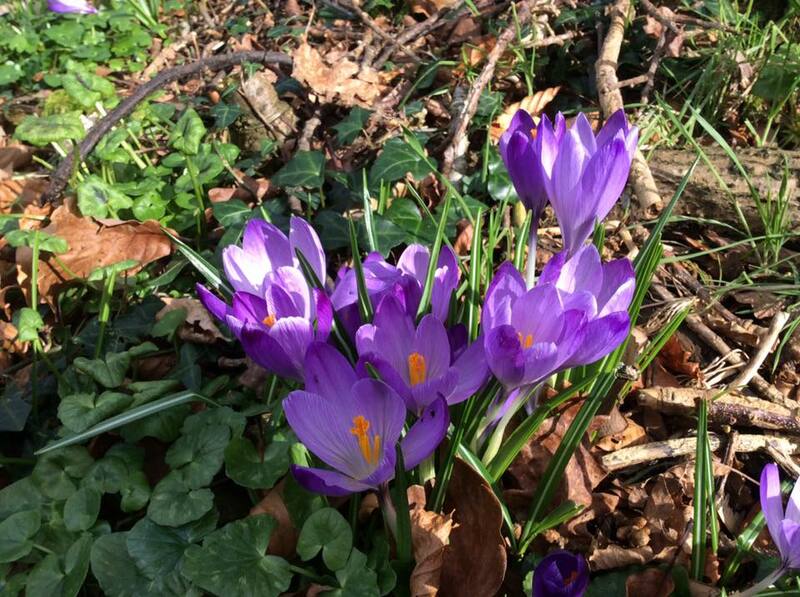 The first signs of spring are the daffodils and magnificent crocuses. Even though both these flowers are delicate to look at they are hardy spring flowers surviving chilly nights. If you live in an urban setting some amazing potted varieties can be purchased for very little in your local supermarket to brighten up any living space, both inside and out. A pleasure that takes on a new dimension is walking in springtime. The changing nature of the outdoors can be felt everywhere in the months of March and April and this is a perfect time to get out for walks and strolls. Country lanes take on a new meaning with wild flowers pushing through and inviting the walker to look and enjoy the landscape on the side of the road and country boreens. Rent An Irish Cottage has many properties across Ireland that facilitate the enjoyment of flower and bird watching. One favorite of customers is visiting Burren Way Cottages in The Burren in County Clare. These self-catering cottages are in the village of Bellharbour and just 3km from Ballyvaughan. From these modern cottages the flowers and wildlife of The Burren are on your doorstep as well as exploring Corcomore Abbey and the Cliffs of Moher. The Burren Way Cottages are very popular with hill walkers. Another nearby village worth a visit is Ballyvaughan, once a prominent fishing village it still has a pier in use for small fishing activity and watersports that is used year-round. Rent An Irish Cottage’s holiday homes are overlooking the bay and nestled at the foot of The Burren. There are amazing walks in this part of Clare and many day trips to take through-out the county. The springtime is perfect for using this part of County Clare as a base to explore and walk The Burren and surreal coastline. Flowers unique to The Burren start to bloom now and are truly magical to see and spot while out walking. Cliff Holiday Cottages in Liscannor are beautiful modern self-catering cottages, each with its own patio and garden. This is the perfect spot to feel outdoors even when you are inside! From here The Burren is on your doorstep ready to explore as well as the lively pups with nightly traditional music. Other wildflowers that can be found flowering this time of year around Ireland’s countryside include: alexanders, anemone wood, primrose, three-cornered garlic, daisy, blackthorn sloe and the vibrant gorse. There are handy guides on the web to help identify flowers as well as some handy apps. Irish Wildflowers has a month by month guide and can be viewed here. It is impossible to walk this time of year without noticing the fresh colour and scents around every country road. Another surprise while walking this time of year is the welcoming of springtime activity by the birds that fill the air with beautiful song, morning, noon and evening. You can hear non-familiar sounds after the long break of winter. You can feel the excitement in the air as the blackbird gets giddy with joy and singing his heart out, tending to his young. Most birds are tending to hungry nestlings and they can be heard but it is hard to locate them. To hear a blackbird in the countryside is just magical. On the shoreline birds like the curlew are more vocal due to more food being available and territorial behaviors – but they are a delight to watch with their elegant shapes, sounds and interaction with the landscape. They can be seen on marshlands, shorelines and sometimes riverbanks. Whatever you choose to do outdoors this springtime we hope you enjoy it and that the fine weather ‘lasts’ as we say in Ireland!